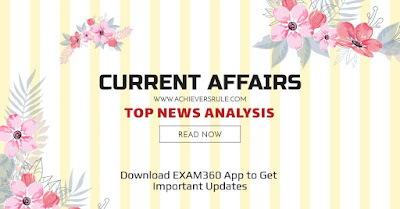 Our Today's Current Affairs Updates for 9th June 2018 has a portion of the Latest News Headlines included here, for example, RBI to set up public credit registry to curb bad loans, West Bengal Governor Keshari Nath Tripathi was given the additional charge of Tripura, The Himachal Pradesh government decided to scrap the semester system in graduate courses under Rashtriya Uchchatar Shiksha Abhiyan (RUSA) and restore the annual examination system from the coming session.. The greater part of the picked news have been set under significant headings which are imperative for the up and coming government examinations of Bank like IBPS PO, IBPS CLERK, SSC CGL, SSC CHSL and other comparable examinations. These are exceptionally urgent and hopefuls must experience them in subtle elements alongside our Static GK and Note Down Points and Daily Current Affairs Quiz. The President of India is pleased to appoint Keshari Nath Tripathi to discharge the functions of the Governor of Tripura, in addition to his own duties, during the absence on leave of Tathagata Roy, Governor of Tripura, it said, without citing reasons for his leave. The Reserve Bank of India (RBI) said it would set up a public credit registry—an information repository that collates all loan information of individuals and corporate borrowers. The state holds good potential in world trade. Export of the pineapple to foreign countries is a major step in connecting with world trade, Kovind said during his address at a reception programme here this evening. General Chhetri will attend the Officer Cadet's 'Passing Out Parade' as Chief Reviewing officer at Indian Military Academy in Dehradun. The work that will be carried out by investing the money, will be completed by the end of March 2019. Hundreds of people will get relieved as they would no longer have to worry about their houses getting washed away by strong currents. The first of its kind, 578 meters long Theng tunnel has been dedicated to the people of Sikkim and the nation. Addressing the industrialists here after launching the portal, the Minister said that online portal would facilitate the industrialists for Regulatory Clearances and Fiscal Approvals , real time tracking of applications at common platform. During his two-day visit to Tripura, the President inaugurated 73 km long National Highway connecting Udaipur town in Gomati district and Sabroom in South Tripura. He also laid the foundation stone for the re-development of Matabari Temple Complex at Tripura Sundari temple. The designated banks are free to fix the interest rates on short-term bank deposits (STBDs), which are for a short period of one to three years (with a facility of roll over). When asked about the technical problems in starting annual examinations with Choice Based Credit System (CBCS), he said the university has been asked to work out the nitty-gritty. India captain Virat Kohli's phenomenal batting form has fetched him the BCCI best cricketer award for two seasons, while World Cup stars Harmanpreet Kaur and Smriti Mandhana were chosen for the women's equivalent of the honour, the Board announced. She achieved the feat during India's Women's T20 Asia Cup match against Sri Lanka on Thursday in Kuala Lumpur.